Marco Pierre White has long been considered the wild child of the culinary scene, although he actually seems like a rather charming character in interview these days. For those who don’t hail from these shores, Marco is a celebrated British chef, restaurateur, and television personality, and was perhaps the first British celebrity chef; he was, at the time, the youngest chef to be awarded three Michelin stars. Marco Pierre White Steakhouse and Grill in Windsor couldn’t be better placed for locals and tourists alike. It can be found in one of the most beautiful Georgian buildings in Windsor at the Castle Hotel which is just opposite Sir Christopher Wren’s Windsor Guildhall. It’s just a few minutes’ walk from Windsor Castle, the largest and oldest inhabited castle in the UK and one of the Queen’s favourite homes. 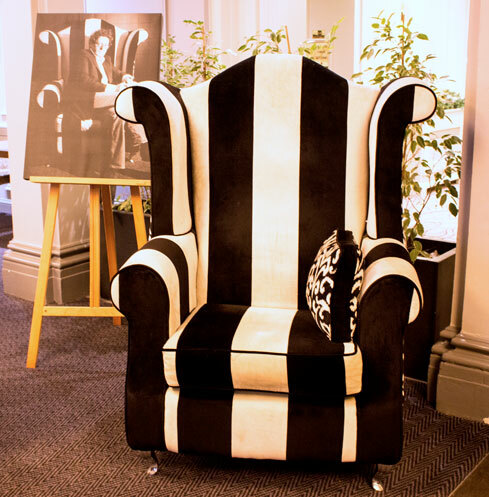 It’s a beautiful spot with classic Dickensian charm, although the Steakhouse is bright and modern and occupies the street side of the Castle Hotel, so it’s unmissable. The restaurant is Marco-themed with black and white images of the chef as a young man wielding a meat cleaver, but there is also a poster of the more mature restaurateur in sedate pose in an armchair positioned to welcome diners to this rather smart eponymous establishment. Marco offers classic dishes as is fitting for this iconic location. The name suggests steak as the main menu item and that does seem popular with regulars and hotel guests alike. The menu lists a variety of cuts which are succulent and well-flavoured, being aged for 28 days. Yes, that hanging does make a difference. For those wanting to push the gastronomic boat out then order the Côte de Boeuf from Scottish Buccleuch grass-fed cattle. This outstanding steak is for two hungry guests. There are retro dishes aplenty and the menu is no worse for that. Good to see prawn cocktail here. It was popular in the 70s because it was good but perhaps too ubiquitous. It’s a standard presentation here with the prawns bathed in sauce Marie Rose, and buttered brown bread on the side. 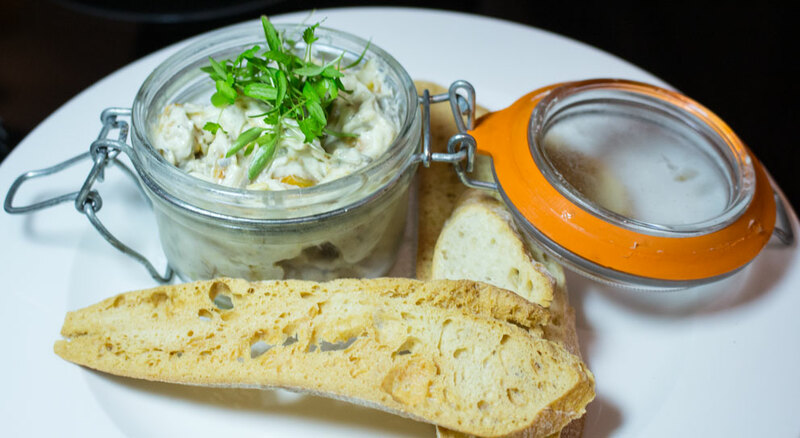 Brandade of mackerel should be a signature starter. The smoked fish is laced with a fresh horseradish mayonnaise which was well-balanced and didn’t overpower the mackerel. Served in a preserving jar with toast Melba this was a substantial delight! Chicken à la Forestière is a great-value main dish, being under £15. 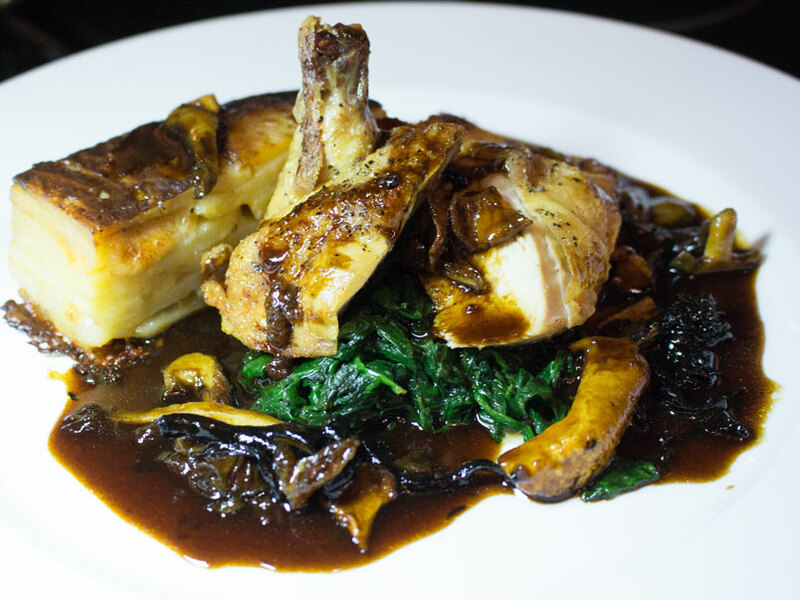 Roast chicken supreme, wild mushrooms, wilted baby spinach, potatoes Dauphinoise, made a wonderfully umami-filled plateful. The chicken was glistening with a savoury mahogany lacquer and the dish tasted every bit as good as it looked. I don’t often return to restaurants and order the same dish again but it would be tempting in this case. For those looking for lighter fare I would recommend Marco’s Classic Caesar Salad. Cos lettuce, avocado, anchovies, croutons, Parmesan and topped with grilled shrimps was a hearty meal but one which made this diner feel noble – full and noble. Desserts are traditional. Cambridge Burnt Cream is a British version of Crème Brulée. It was introduced at Trinity College, Cambridge, in 1879 with the college arms scorched on top of the cream with a branding iron. Eton Mess was bound to be on the menu as the famous public school is just a short distance away. The Box Tree’s Eton Mess is described as the perfect mistake! 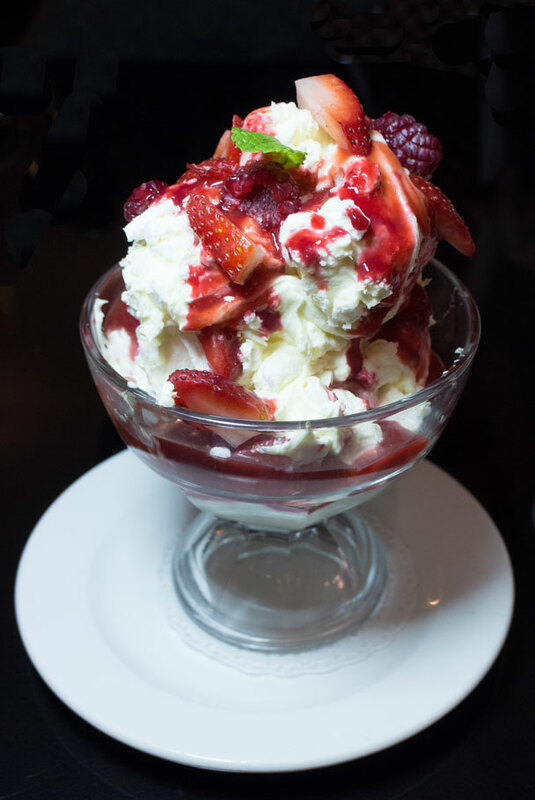 Yes, indeed, the first Eton Mess is rumoured to have been something of an accident, but this mishap has been refined into a moreish confection for any lover of sweet meringue and cream. Another substantial helping. I rarely cover celebrity restaurants. They don’t need my help to fill tables. I often muse that perhaps they don’t even need to produce good-quality food to have a full house. But Marco Pierre White Steakhouse Bar and Grill Windsor was a pleasant surprise. The food was first class, the menu was classic and comforting, and the execution of those dishes was spot-on. Portions were generous and the prices reasonable. I’ll be back for half a Côte de Boeuf.